IT’S A SCENARIO about as removed from the traditional classroom as most of us can imagine. At the start of a lesson, instead of taking out books, copies, and pens, a classroom full of students reaches into their bags and pulls out iPads. That’s what one Irish start-up is aiming to be a part of aPperbook, based in Dublin’s digital hub, is a platform for delivering school books to tablet devices. “It’s the complete replacement with digital content”, explains co-founder Ruth MacPartlin. The digital education revolution is already more advanced in Ireland than many would think, she explains, with 15% of Irish classrooms already switching to e-books and tablets in favour of books. When it’s done well, MacPartlin and co-founder Liam Twomey say, the educational and lifestyle rewards for students are easy to see. Lighter bags make more room for larger, healthier lunches and sports gear, while interactive learning materials improve exam scores. However, it’s not as simple as pushing a button, they argue. And in Ireland, there’s no guarantee that progress to date is going to be built on. 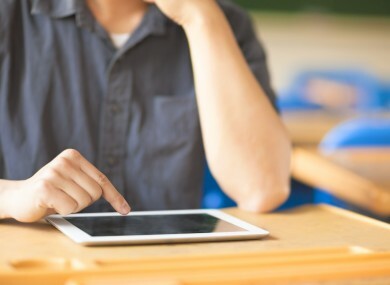 Transitioning to paperless classrooms can be a fraught process. Education systems are complicated places, with lots of stakeholders – teachers, students, parents and education boards, to name but a few. Simply throwing money – or iPads – at a problem is unlikely to make it disappear. A recent attempt to roll out tablet-based learning in Los Angeles proves this, MacPartlin says. It’s a cautionary tale that Irish educators should be aware of, Twomey says. “You’re expecting teachers to manage the change infrastructure within the schools, that’s not good enough”, MacPartlin adds. There’s disruption on the technology side, there’s disruption on the teaching methods that digital can deliver, and there’s disruption in terms of national teaching systems too. On top of these challenges, the pair rate the poor standard of broadband infrastructure as one of the main factors holding back development of the digital classroom in Ireland. The fledgling company’s best customers are in fact in emerging economies like South Africa and Brazil. “The opportunity in these emerging economies is already bigger than the UK and US. They can leapfrog us. It’s like in Eastern Europe with their internet connectivity – they’re way ahead of us because they put it in so late in the noughties and the nineties”, explains MacPartlin. They can look at what’s out there, what’s best in class in the market, and learn from others’ mistakes. How can Ireland avoid mistakes and build on the progress it’s made in the last three or so years, since the first paperless classrooms were introduced? The major risk at the moment, according to Twomey, is rolling out digital services without any central policy to support it. The Government is currently consulting on a digital education strategy, but in the meantime, it comes down to whether individual principals push paperless classrooms in their schools. According to Twomey, a concentrated effort needs to be made across the education system if the benefits of paperless classrooms are to be realised. If the paperless classroom is to become a reality across Ireland, it seems that lot of moving parts need to operate in unison if we’re too see the arrival of the paperless classroom. This month’s theme on TheJournal.ie’s SME hub is the Education sector. Email “What I learned: striving for the paperless classroom”. Feedback on “What I learned: striving for the paperless classroom”.